Ed and Al stand outside headquarters in the rain. Ed is apprehensive to see the Colonel with bad news again. Just before resolving to face the music, the two boys are bewildered when a loud scream rings out. It's Breda (he hates dogs). He's afraid of a small dog that wandered into headquarters. Seems Sergeant Major Fury found him shivering in the rain and brought him in. The Sergeant lives in the dorms and animals are not allowed. He asks if anyone can take care of it? Edward and Al peek in as they are talking. A short time later, Edward gives his report to the Colonel. After going through all of the events where Ed has been involved, the boy questions the Colonel regarding Dr. Marco. The Colonel says he doesn't know of him, but Ed has his doubts. Suddenly, the doors open and in walks several military personal led by Brigadier General Gran and the Fuhrer. They apologize but say the Colonel's office will now be used for a temporary Central Headquarters. While the Fuhrer is making his apologies, Ed can't help but stare at the familiar face of the man's secretary. In the cafeteria a little while later, Ed sits among the many other State Alchemists. The now Lieutenant Colonel Hughes in charge of investigations asks how his search for the philosopher's stone is going. Ed explains his thoughts on Dr. Marco and how he is sure the Colonel is hiding something from him. Brigadier General Gran overheard them and told how Dr. Marco was a runaway. He added, "Six years ago, many alchemists were gathered at the rebellion in the East. Marco ran away from the battlefield before the battle ended. He's been missing ever since." Ed confronts the Colonel with what's he's learned and yet the superior officer still denies knowing Dr. Marco. Ed decides to look through library records, but can't find a thing. That's when Hughes steps in and says that Ed must take an assessment to update his State Alchemist qualification. The sly little Ed wants to try his own way of passing the assessment. He wants to try a combat assessment with him and the Colonel. If Ed wins then the Colonel must take care of the cat that Al has been harboring. It even meets with the Fuhrer's approval. Outside headquarters Hughes announces the combat assessment as many soldiers watch. Of course, he must add some gloating over his precious daughter causing everyone to moan and throw things. The battle begins quickly with Colonel Mustang attacking with his flames. Seems his right glove is made from some special cloth called ignition cloth. When he rubs it with force, it creates sparks. That plus his adjustment to the oxygen concentration in the air and.....boom! Ed is racing around just trying to dodge the Colonel's attacks until he makes his way into the audience. That doesn't stop the Colonel from using his flame alchemy. However, it's just enough time for Ed to use a disguised dummy....then attack the Colonel from behind. Ed manages to destroy the Colonel's glove. He then creates a huge cannon. Sorry Ed...the Colonel can use his other hand. Boom the cannon is destroyed and Ed is sent flying. When Mustang has a flashback and hesitates in finishing Ed off, the tables turn and Ed appears to get the upper hand his sharp automail pointed at the Colonel's throat. The Fuhrer applauds the action saying the fight must end or there will be too much clean-up. A little while later, both Ed and Colonel Mustang were ordered to clean up the mess. While they are working together, Ed asks the Colonel why he went easy on him. The Colonel explained his unpleasant experience in Ishbal. He then said that Dr. Marco was the sanest of everyone. To Ed's delight the Colonel even told him that Dr. Marco is indeed alive. Inside headquarters, Liza Hawkeye has volunteered to keep the small dog. But when it gets loose and does his business against one of the walls, she pulls her gun and fires several rounds. She says she is a strict disciplinarian and calls the dog Black Hayate. The others look on in shock....especially Fury. That evening, Hughes and Mustang are downing a couple drinks at a nearby pub. Hughes informs his friend that General Hakuro's unit was dispatched to Lior. Seems the new head priest is telling the people to fight against the military. A civil war is taking place there as they speak. Hughes asked if they should tell Ed, but the Colonel wants the boy to keep believing that he has saved the city. Meanwhile, Ed and Al are sure they will find Dr. Marco based on the Colonel's information. In gaining that valuable information, Ed didn't think the Colonel should take care of the cat. (Based on equal exchange...) The boys leave the kitten sitting comfortably outside headquarters just before venturing out to find the man they hope will get them closer to the philosopher's stone. Returning to Hughes, he informs Mustang how the brass convinced the Fuhrer into escaping. Seems in Central City alone, five state alchemists and related personnel have been killed. (Flashes show Scar and his next victim) Uh oh....Scar is heading to East City next! The civil war in Lior rages on. The military are killing people without mercy. Who's behind all this? It happens to be Envy disguised as the head priest. It was he who is encouraging the people to resist the military. Lust and Gluttony watch with disgust at the pitiful humans. At a local bar, Hughes and the Colonel are having drinks while discussing the deaths of several military alchemists. So far, nine have been killed by a man they refer to as Scar. The name was given to the culprit, because there is a large scar in the center of his forehead. All of the victim's bodies appear to have been detonated from the inside. Their conversation is interrupted when Hughes gets a phone call. Another soldier has been found....his death mirrors the others. Elsewhere, Ed and Al have tracked down Dr. Marco. He is using a phony name and helping the villagers. When the boys approach the doctor, he is far from friendly. It isn't long before the doctor begins to trust the boys (slightly). He tells them of the atrocities that occurred during the war in Ishbal. He could not take it and ran away. Ed is encouraged to learn that the military may be able to create a philosophers stone, but Dr. Marco refuses to show the boy his research. That doesn't stop Ed. 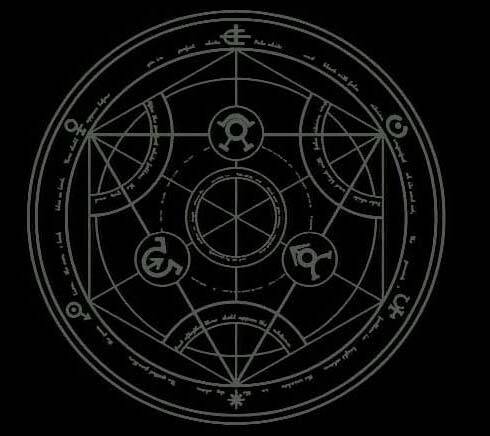 He uses alchemy to break through a wall uncovering a vial containing the miraculous red stone. Just as he finds it, in bursts Brigadier General Gran. The large man confiscates the stone and takes Dr. Marco into custody. The saddened villagers watch as the General's car drives off with their precious doctor. Ed has a sudden change of heart and goes chasing the vehicle. Before he can get to it, a large man with white hair places his hand on the vehicle causing it to disintegrate. It's SCAR!! The General has no time to retaliate! Scar grabs him by the head and flushes him out (Literally....get the pun?). He then turns his attention to Dr. Marco. Ed grabs the doctor and runs. Al tries to help them to escape, but it isn't long before Scar comes crashing through the wall. Scar looks at Ed and tells the boy that he has the kind of eyes his older brother had. Ed asks, "Why are you doing this?" Scar's reply is that alchemists violate the teachings of God, and he is a representative of God....an executioner. Both Ed and Al attempt to ward off Scar, but it isn't until Armstrong appears that the boys are able to escape with Dr. Marco. Once the three have reached safety, Ed returns the stone to Dr. Marco. The boy tells the man how he cannot forget the looks on the faces of those that the doctor helped. The three agree that as long as they have legs (or auto-mail...ha, ha), they will find a way to escape from Scar. NOTES: There are, also, a couple of brief scenes where Rose is protecting some children of Lior. When discovered, she is questioned by a soldier and slapped when she refuses to co-operate. Will Scar catch up to the boys??? Keep watching!